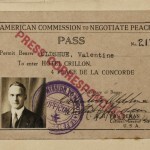 While in France, Valentine Oldshue was affiliated with an American hospital, but he also worked for the Red Cross and was a correspondent for the American Legion. Since he was a writer by trade, his collection is an especially good resource about the period. For example, if you want to learn about the ambulance service he worked for, read his pamphelet What American Ambulances are Doing in Paris. 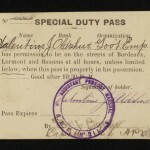 But the bulk of the collection is postcards Oldshue sent from Europe to Catherine Wilson. Some have illustrations on the back, but a good many feature photography, either normal tourist scenes or scenes from wartime France. 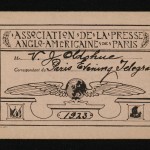 Check out our HistoryPin tours of Oldshue’s postcards, where you can follow his 1915 and 1916 travels in France and Switzerland, as well as his 1919 journey home, which took him from France to the U.S. … by way of Italy and Albania?